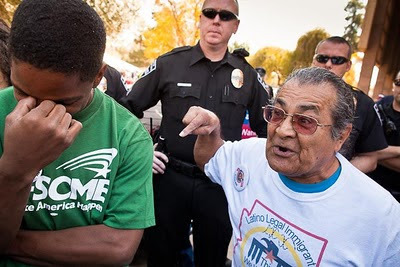 An opponent of undocumented immigration, right, argues with a supporter of immigrants’ rights at the Arizona State Capitol Tuesday before an Arizona Senate committee started discussion of several bills that would further reduce the rights of undocumented immigrants in Arizona. These bills, and others (like the abolishment of the Arizona’s Medicaid agency) brought hundreds of people to the Capitol. Most were opposed to the immigration bills but there were also Tea Partiers, who support almost all of the legislation; medical professionals, who oppose the hospital bill and dissolution of Medicaid; educators, who oppose the education portion of the immigration bill; bikers, who were coincidently at the Capitol for a picnic scheduled weeks ago but ended up supporting the bills to limit undocumented immigrants; and unionized state workers who showed up to support workers’ rights that under attack in Wisconsin and elsewhere. It was a cornucopia of people and competing interests and ideas. It was democracy. There are more photos from the day in my archive.